Whether you're a serious breaststroker, an IMer, or just want to get faster, working on your turns can be the simplest way to improve your times and your workout efficiency. 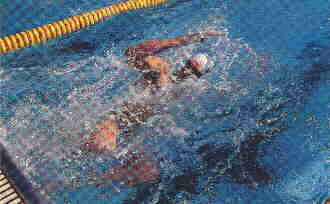 Competitive breaststroke is an unique stroke because an underwater "pull-down" is incorporated into the start and each turn. For the average breaststroker swimming in a short course pool, 25 percent of his or her race is spent underwater and more often than not, this is where breaststroke races are won and lost. For any stroke, making technique changes can be daunting. But think of it in these terms - if you swim more than 3000 short course yards in a workout, you have at least 120 opportunites to work on a particular aspect of your turn. By virtue of sheer repetition, it won't take long to make those changes that will ultimately improve every aspect of your swimming. It is best to work on one particular technique at a time until you feel comfortable with it and then move on. Do not try to work on too many things at once because you will just get frustrated and never master any aspect of your turn. The first rule to remember for the breaststroke turn is to always kick into the wall. Often, breaststrokers are lazy and pull into the wall. This causes two problems: First, it's impossible to continue the momentum with just a pull, and second, pulling alone causes the hips to sink, making it difficult to begin the turn. The key ingredient for success is to prepare early. Adjustments must be made at least three strokes from the wall, just as a long jumper must adjust his or her stride long before the actual jump is made. Of course, as fatigue sets in, the length of your stroke will shorten, making the process of always kicking into the wall a constantly changing proposition. It is important to "hit the wall" at the apex of your stroke extension with maximum forward velocity. Think of the wall as a hot plate, forcing you to spend as little time as possible touching it. Your arms must act as springs so that you bounce off the wall, always remembering not to grab the gutter. Simultaneous with hitting the wall, your heels are brought up to your buttocks and your knees are tucked under your body. The tighter the tuck and the more velocity you have going into the wall, the quicker the turn will be. As your legs are brought directly under your body, your head and torso should lunge backward. Throw your head straight back so that you are looking directly upward, either at the sky or the ceiling. If you are looking into the gutter or to the side you are doing it incorrectly. The hand that recovers over the water should pass beside your ear and the arm that recovers under the surface should remain close to the body, slicing through the water like a knife. Continue to "fall back" until your feet are planted on the wall and your hands meet behind your head, preparing for the next phase of the turn. Fall Back-Head and torso lunge backwards; the hand recovers over the water and beside the ear. Your feet should be firmly planted on the wall with your toes pointed upward at a line nearly parallel to the surface of the water. Be sure not to turn around onto your stomach before the push off because this requires a great deal of effort and creates a lot of resistance. You might now be thinking, "But if I do this, I will push off on my back!" and more or less, that's true.You should turn over onto your stomach during the push off, not during the turn. 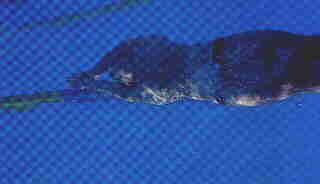 This is commonly called a "corkscrew" and is completed as you are pushing off the wall in a streamlined position before the underwater pull-down begins. To be safe, all breaststroke swimmers should be aware of the turn rule that states "the shoulders must be at or past the vertical toward the breast when the feet leave the wall." "Streamline" is the term used for an optimally hydrodynamic glide through the water. You want to preserve the velocity from the push off for as long as possible by locking one hand over the other and squeezing your arms against either side of your head. It is extremely important not to push off the wall like Superman, with your arms apart and your head up. There is no quicker way to put on the brakes. And always remember, the three easiest ways to improve your turns are to streamline, streamline, and streamline. As you begin to slow down after your push off, your hands come apart from the streamlined position and do what is essentially an underwater butterfly stroke. Be explosive and concentrate on accelerating until your hands are at your thighs. Keep your head still and look directly toward the bottom of the pool to minimize turbulence. After a brief pause, "creep" your hands up your body, paying special attention to causing as little resistance as possible. Begin the recovery of the kick while your arms slip past your torso. As your hands pass your head and extend in front of you, kick your legs, tilt your head forward, and powerfully pop up to the surface to begin your first stroke. While the technique of the breaststroke turn is indeed complex, don't feel overwhelmed. Use the repetition of swimming to your advantage. Take one component of the turn and practice it until it is perfect, and then move on. With a little concentration and a lot of effort you will be surprised how quickly you improve. With practice, tiny details discussed in this article should become smooth, seamless, and fast . . . never lose sight of this. The perfect turn is one that beats the Speedos off your competition. John Moffet is a former world record holder in the 100 meter breaststroke and the 400 medley relay. He was a 1980 and 1984 USA Olympic Team Member and was a five-time NCAA champion at Stanford University.